North of the Turkey Foot in Boulder Creek, the Santa Clara Valley Mill & Lumber Company line criss-crossed the ever-shrinking river six more times before Waterman Switch. Those trestles built north of Waterman Switch are uncounted and no real remnants remain of them. Of the six, two have known historical photographs while one of those also has contemporary photographs taken by Rick Hamman in the 1980s. The first trestle north of the Turkey Foot, and the first of those with historical photographs, is the Wildwood Trestle that passed through the Cunningham Mill and, later, the Wildwood subdivision. The photograph shows two ladies and a child walking down the tracks toward the trestle. The trestle appears to be a Howe Truss design, though further details are uncertain at this distance and angle. The Dougherty Extension Railroad passed through Wildwood in 1889 crossing the river just across from River Drive. The tracks were pulled in 1917, though at least this trestle may have been disassembled rather than simply abandoned. Remnants of the trestles have not been confirmed, though a rumor exists that portions of it survives near the river bed just to the west of Pleasant Way. The only other photographed trestle was one of the three Riverside Grove Trestles, specifically the one that passed through the Santa Clara Valley Mill & Lumber Company mill site. This trestle was a short span that sat beside a ox and mule bridge and is barely discernible in its historical photograph taken of north of the mill in 1895 (above). 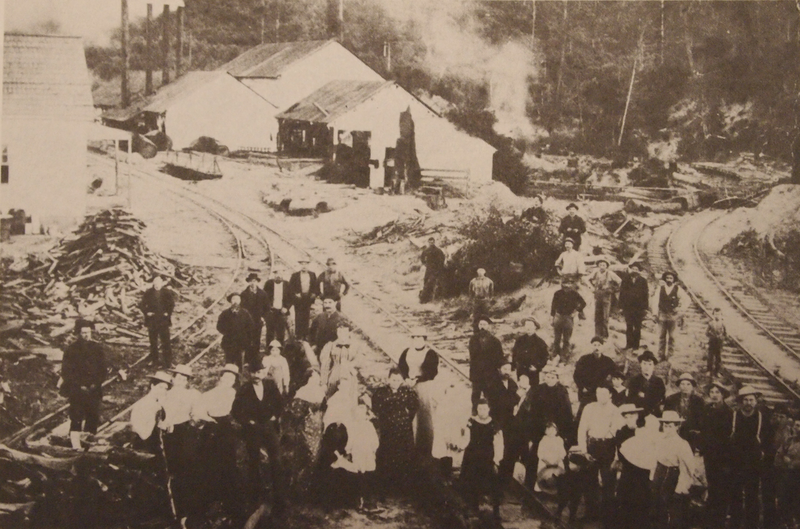 The trestle itself would have been built around 1889 when the Dougherty Extension Railroad was advancing up the valley. Details regarding the southernmost trestle are unknown. Around 1980, Rick Hamman took a photograph of one of these trestles, likely the most northernly of the three, while he was preparing his book California Central Coast Railroads. 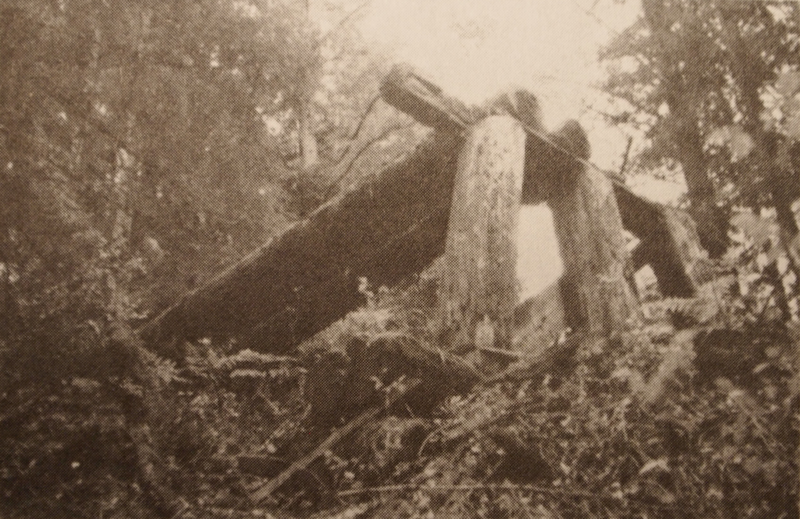 The photograph shows that this trestle was a basic log-build trestle with rows of three large trunks acting as piers supporting two smaller and longer trunks that supported the ties and narrow-gauged rails. In 1980, the entire southern end of the trestle was still intact sans the ties and rail. As with the rest of the line, the rail was sold for scrap in the months leading up to World War I in 1917. The ties likely fell off over the subsequent years. While the continued existence of this trestle has not been confirmed, a rumor states that it was washed out in the floods of 1982. The three trestles were located across from the end of Either Way, directly beside the Either Way auto bridge, and near the end of Bean Avenue, all three roads being of of Teilh Drive north of Boulder Creek. The fifth crossing over the river was at modern-day Fern Drive, just where the road now crosses the river. Though it's original purpose has been lost, the area around Fern and Hillside Drives developed in the years after the railroad left. The clearing may have originally been a logging collection area much like McGaffigan's Mill, especially since the Chase Mill was located further up the hillside from this area. If any remnant of of the trestle here survives, it has not been brought to the attention of this author. The sixth and final crossing caused by the San Lorenzo River was immediately across from the entrance to the Saratoga Toll Road within Castle Rock State Park. This trestle served to bring the trains to Waterman Switch and probably dates to a slightly later time, perhaps as late as 1897 when the logging camp moved to the headwaters of the river. Unlike the other trestles, this one did not cross the river itself but was forced to cross a lowland created by a pond adjacent to the river. Unfortunately, all evidence of this trestle was destroyed when CA State Route 9 was built, crossing the river at nearly this very spot. While the right-of-way is visible on both sides of the highway, the crossing did not survive. In any case, it was likely a very small trestle. The Dougherty Extension Railroad continued up into the valley for another 1 1/2 miles before finally ending near the headwaters in Castle Rock State Park. In its path sat the ever-winding San Lorenzo River, which at this place was little more than a stream during most of the year. Just north of Waterman Switch, the railroad crossed the river at least once, and perhaps three times. It crossed two more times roughly 3/4 mile north of the Switch, and then crossed it at least once more before ending near modern-day Beekhius Road at the junction of the two feeder creeks that join to form the river. The scant evidence of these crossings are only visible by their absence when the right-of-way suddenly ends where the river crosses. In parts, even the right-of-way is difficult to discern from the toll road, other service roads, and the overgrowth of the all-consuming second growth redwood forest. Rick Hamman, California Central Coast Railroads (Santa Cruz, CA: Otter B Books, 2002). 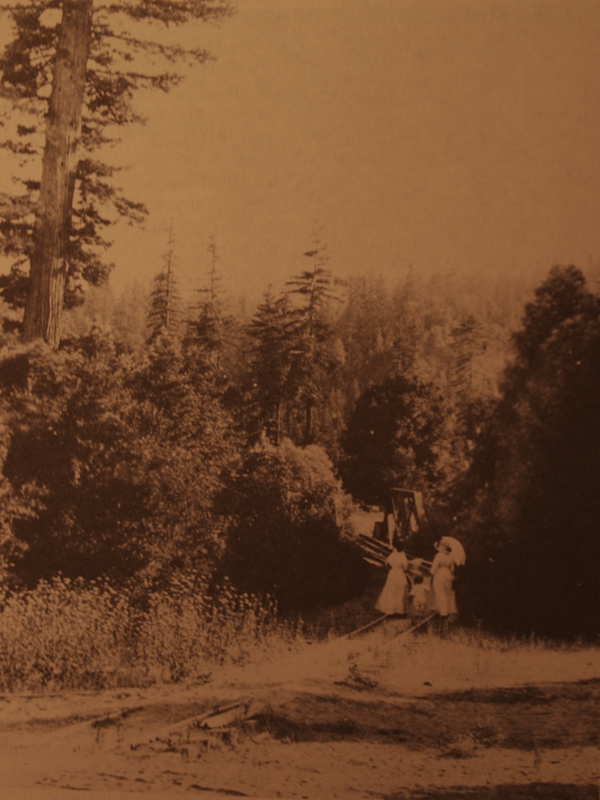 The 1916 photo with the three people walking the track looks just a little like Brookdale, but not in 1916 due to the narrow-gauge and all those taller trees. There is probably a good reason to say no; I, however, see a similar bridge, a clearing with a large dark tree on the other side, and a peculiar slant to the sunlight and shadows (as if the track was angled into the west). I wouldn't know the area around the Wildwood trestle though, and may lose the observation because a wooden truss has more visible notches and the curvature of the track doesn't correspond (and is too overgrown with weeds). It's definitely not Brookdale. The trestle there was much longer and the approach was a narrow cut. The direction of the Wildwood Trestle was roughly the same alignment as the Brookdale Trestle, which may explain the similar lighting. This trestle was also the last of those create for passenger service. Those north of this site were reserved for freight-(and workers-)only. I apologize for the low quality. It is a photo of a photo of a photo taken in poor lighting conditions. Passenger service, that explains the tilted curve a little better; which was another reason I felt it was a mislabeled photo. While there is always some banking of the curves, this track seems to have had faster trains in mind rather than pure lumber. I believe that curves were built this way to relieve binding and wear, increasing it to help stability and traction as speeds increased, but I could be somewhat wrong. I wonder if the bridges at Brookdale and Ben Lomond could be backdated as an earlier narrow-gauge construction? If there was enough room and support, the mystery of the wooden bridges might become known. The simple trestles at each end would need an entirely new design, but maybe it was easily accomplished. Well everything north of Boulder Creek was private Santa Clara Valley Mill & Lumber Company rails, so they may have routed telegraph service elsewhere or just not had it at the mill. The bridges at Brookdale and Ben Lomond could certainly be earlier bridges that were either built with standard-gauge in mind or were easier to expand. As the bridges were replaced in the late 1890s, they were upgraded to standard-gauge in expectation of the conversion. The first to get upgraded was the Clear Creek Trestle, which had at least one concrete foundation built, but that doesn't mean the other bridges weren't upgraded soon after with other types of material.